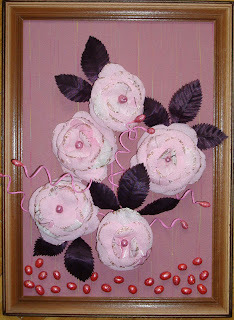 A composition of modest pink roses with glitters on the petals margins. The light color of the flowers is emphasized with the dark violet leaves. Décor at the bottom of the picture is actually made of painted with nail-polish beans. Fabric with fine vertical colorful lines on the background.